​$175 and includes lifetime registration. Carla was born on the streets after her mum Cathy was dumped by her former owner over 6 years ago and left to have litter after litter. Carla was scrawny, had large raw scabs on her skin likely from a flea allergy, and was constantly drooling thick smelly saliva. I felt sorry for her as litter also kept sticking to her tongue and had to be picked off before she could eat properly. Stomatitis was confirmed and although she had a dental early on in care, she needed a 2nd dental to remove all of her teeth. Safe and loved in care with us, her coat, like her mum's, has grown lush and long. Her eyes also look brighter and happier ... there is a beautiful sparkle to them. Both mum and daughter have that trademark tongue sticking out look. She wasn't handlable in the beginning and very scared cowering in the corner but over time with socialisation work to gain her trust, she has discovered how good it feels to be touched and feel the kindness behind it. I managed to capture a video of THAT moment she first succumbs! It's one of my favourite and rewarding moments in rescue. She enjoys the simple life of a cat where she can happily laze about, but also has a playful side where she can't resist chasing after string toys or that laser light! She loves being brushed and patted, rolling her head over in delight. She has the cutest face and sweetest personality. 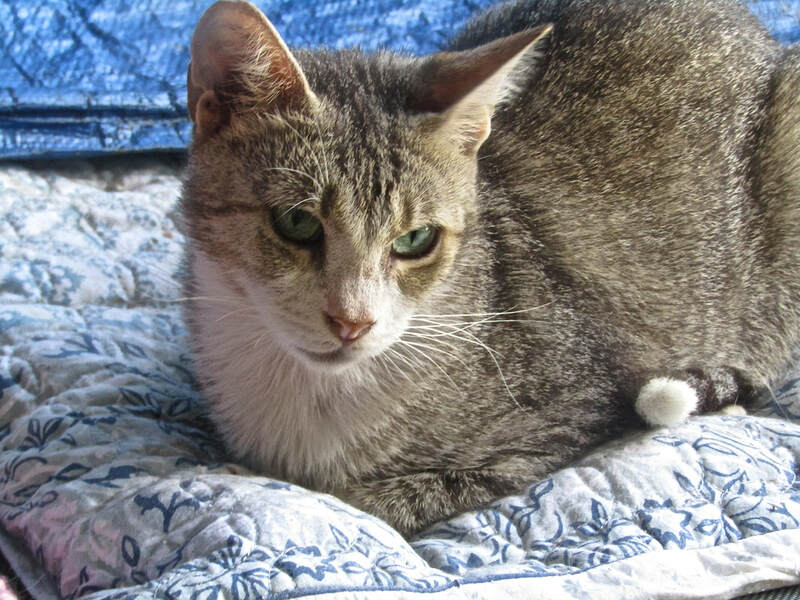 Carla has been desexed, vaccinated and is up to date with flea and worming. She is negative for FIV & FeLV. Carla like her mum has a keen love of food although she has no teeth as she suffered from stomatitis and needed them all removed.